Discussion in 'The Comics' started by WOLVERINE25TH, Dec 4, 2005. 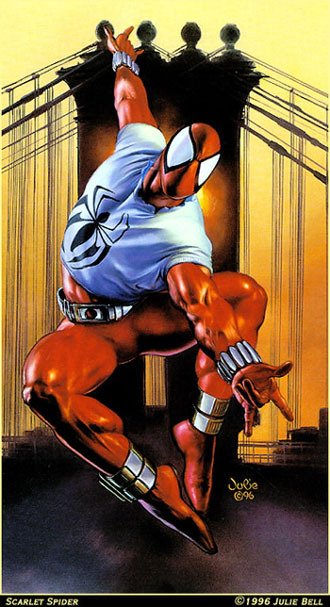 This is the thread for us; the few, the proud, the fans of Ben Reilly! That's right, this is a thread by his fans, FOR his fans. 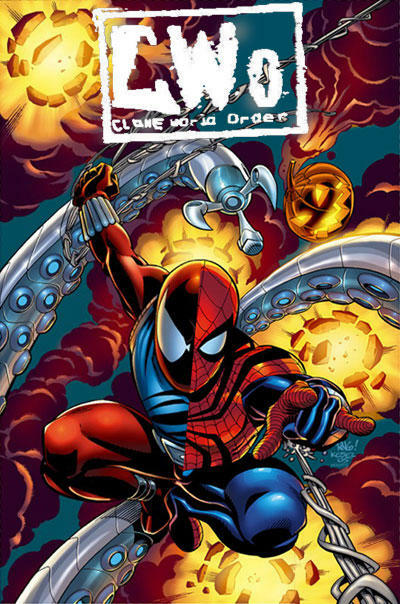 If you hated the Clone Saga, this thread ain't for you. There are countless other threads around bashing it and you'd probably be happier there. This is STRICTLY for those of us who thought the good outweighed the bad to give us an open forum to discuss the best webhead ever nearly 10 years after his wrongful demise. Fans of Reilly, you may enter! So, Reilly Fans, lemme put this to ya; what subplots durin' Ben's run would you have liked to seen go on? Ya know, all th' stuff that died with th' character. I hate wrestling with a passion, so I can't say that banner is my favorite thing in the world. We all know that Marvel will bring Reilly back one day as some revenge crazed lunatic who'll cross the line that Peter dares not touch. But I'm thinking until than maybe Defalco should use him in Spidergirl, I know he's got a kid with Jeanine (Who I reallllllllllly hope, is the character from the Parkers past, thats gonna show up in issue 93) But hell its in an alternate universe, and Mayday could use a new mentor, now that Phil's been Goblified. Well, I was gonna go with another banner but I couldn't find a Spidey font other than th' movie. I personally loved how they handeled the relationship between the two. Reilly was clearly a different person then Peter, who'd lived a different life and had different views and experiences. Regardless, they formed a bond in time that was as close as brothers that only really got to shine in the last few issues with him alive. As for Reilly, I was thinking about him quite a bit today. Going over things in my head, ways new stories could be introduced to the 616 that harkened back to Rielly. I would love to see him come back, and it WOULD be very easy. His death went against all continuity of clone degeneration, and the man that was impaled on the glider could be passed off as a clone. However, I don't see that happening any time soon, at least not until one of us or Defalco gets to writing a core book. One thing I did think of that I personally love, would be a daily grind person stumbling upon Peter one day, and thinking that it was Ben. The opposite of what happened with Ben a few times. Really, to think of all the supporting charecters running around back then. You had most of Peter's co workers and friends, and then the new group surrounding Reilly. It was fantastic. And now, prior to Peter joining the NA, there was almost no supporting cast. So many great people, all just brushed under the carpet and never mentioned since. Here's hoping we see some soon. Eh, ya shoulda made a thread an' we'da been behind ya. Along with what you've all said, I'da liked to know what happened to Jessica Carradine. She's spent all her life hatin' Spidey fer "killing" her father, but then forgives him just in time to disappear. Some closure there would be nice. Yeah. But then again, closure with a lot of the stuff back then would be nice. No, they never explained it. He was just there. Oh, and to add to the Daily Grind group....how about we get some Kaine back in the 616-verse?? Yeah, totally! Although he did kinda reform in Redemption. Hate to see that retconned. Yeah. Sad to hear that the Jackal just kind of appeared somewhere else. Yeah. Thanks to lack of continuity footnotes we've no clue if that mini took place in th' past or present. Spider-Girl is a Clone Saga Fan's best friend. One of my favorite covers by my favorite artists (Bags).